The four training plans contained within this packet details 29 weeks (approx. 7 months) of training in preparation for your backcountry big game hunting trip. Start the plan exactly 29 weeks before your first day of the hunt. Backcountry Big Game hunting is one sport which bridges the mountain and tactical focus of our training speciality. On the tactical side, the fitness demands of backcountry big game hunting include loads and rucking distances similar to long rucking events at military selections. Game pack outs from successful backcountry hunts can include rucking 100-pound+ packs up to 10 miles over rough terrain and mountain trails to the trailhead. Often, these loads not only include your boned-out game, but also your backcountry bivy camp. As well, it’s not unusual to have to make 2-3 trips. On the mountain side, expect a 30-45 pound bivy pack, moving up and down miles of trail-less drainages and ridges to find the game. This uphill hiking strength and cardio, and downhill hiking fitness and durability, are fundamental fitness demands for mountain athletes. The four plans in this this packet is organized so that each plan will build your fitness for the next. The purpose is to build sufficient fitness to prepare you physically and mentally for your hunt. This training packet is designed for athletes with a reasonable level of fitness. If you are unfit, overweight or deconditioned, we recommend you add 7 weeks to the timeline, and complete the Bodyweight Foundation training plan twice, then move on to the remaining plans. work, eccentric leg-strength training for hiking downhill. It’s very important you complete the final, Backcountry Big Game Training Plan the 8 weeks directly before your hunt. The price for this packet of plans, $159, represents nearly a 20% savings over the combined price of the individual plans. What’s included. Is there an app for your phone or is just access to website? No app. Access is online via a desktop or phone. Do you get all the training at once? Yes. With purchase, you can see every plan and every training session. How many times per week are you training? How long is each session? For most of the training plans, 5 days/week. Most sessions are 60 minutes long, but some of the endurance sessions and sessions in the final plan can extend for 2-3 hours. How do I know if I’m fit enough to start this training? This programming is designed to address the fitness demands of a backcountry big game hunt in the Western US or Alaska …. not the individual hunter. However, the programming is “progressive” in the sense it gets harder as you work through the plans in the packet. Will you be able to do it? We recommend clicking the “Sample Training” tab for the first plan, Bodyweight Foundation, and trying those sessions. If you survive, you’re ready. 3 of the plans, Bodyweight Foundation, Humility and the Backcountry Big Game Hunting Program are limited equipment programs. Resilience requires a fully-equipped weight room. Click on the individual plan links above, and then the “required equipment” tab for specifics. 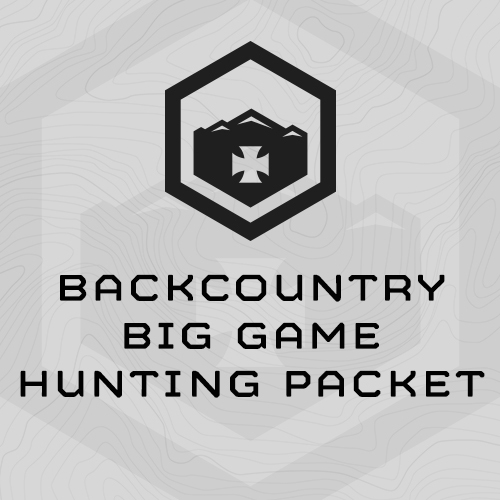 What’s the difference between this product, the “Backcountry Big Game Training Packet” and the “Backcountry Big Game Training Program”? The “packet” is a set of 4 training plans, 7 months of training, and concludes with the program. The program is just one plan, 8 weeks long. Do I need the packet, or should I just purchase the program? It depends upon how fit you are and how well prepared you want to be. It’s up to you. I live in the Mid-West, East Coast, South or somewhere else where it’s low elevation and flat as a plate. Will this packet prepare me for mountain travel? Yes … as best we can… the kicker is elevation. The packet includes focused “mountain endurance” training for uphill movement, eccentric strength training for the downhills, core strength endurance, movement under load, etc. However, there is no magic bullet way to prepare you for the effects of elevation. Best we can do is get you as sport-specifically fit as possible when you arrive. It will take a few days for you to adjust to the thinner air in the mountains. Does purchasing this packet mean I’m guaranteed to get my elk? If it were only that easy. But, if you purchase this packet, complete the programming as prescribed, go on your hunt, and find you were not physically prepared, we’ll refund you, no questions asked. - I never had sore shoulders or chassis from carrying the weight. - I never had sore legs, even after the hardest days. - I felt 100% capable of doing what was needed. - My weight didn’t drop during training (I could work on my diet a bit). My 30-minute step-up results went from 815 (July 15) to 824 (September 26). I would associate much of the modest increase to determination and technique, so it does not indicate a substantial fitness improvement. My weight would have been about five lb heavier in September. In summary, if anyone wants to be capable in the mountains, this program will get them there. The only aspect of my fitness I will change for next season is related to my anaerobic threshold and my ability to push into a higher gear and go harder. As long as it was a slow grind, I was capable. When the time came to push up steeper country, the wheels would more or less fall off and I would be left working at a higher than I thought I should need to (heart rate of 170, for example). The elevated heart rates compromised my ability to think and film, and in steep goat terrain, this can be a liability.